I finished my last project for Meg's "Finish It Up" challenge! Well, I had a sewing cover on my list that I didn't do but I have a good reason! 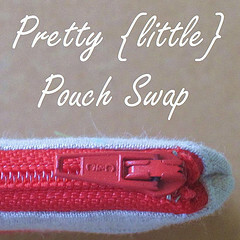 I just joined For the Love of Solids Swap and I might have mentioned to my partner that I am wanting a sewing machine cover! So, I decided to hold out and see what amazing item my partner sends my way. But other than that, all my WIP's have been finished! Thanks so much Meg for putting this together, it was a fantastic idea! Now that my WIP's are finished it's time to start a new list of projects to do, I'm sure it won't take long for it to become a mile long! Well, this was my first attempt at embroidery. I have a few more elaborate patterns that I wanted to try but I thought I should probably start with something easy. I have found something new to add to my arsenal! Awesome Giveaway!!! Check this out! They are having quilting supplies to giveaway 5 x a week for 12 weeks. you could imagine to assist you in being a NEW Quilter. 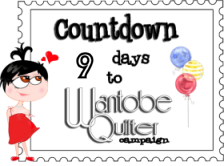 quilting stuff too...Tuesday and Thursday are days for us..
anything I can win something too. That is all! There are over 49 Sponsors involved. I am pretty excited to be part of this, sew should you. I love being a QUILTER! My local quilt shop started a Farmer's Wife Quilt Along and so of course I joined in with the craziness! I figured 2 blocks a week wouldn't be that bad, right?! Well, I finally decided on the fabric and I got to work this morning and produced my first two blocks for week #1. I decided to try out solids for this quilt. Every week will have white as a base color and then I will change the solid color. This week was a bright yellow with a little bit of a yellow print added into the mix. I'm thinking next week might be orange or pink, we shall see! The book comes with templates to use for piecing the quilt and this is the first time I have used templates. It actually wasn't as bad as I thought it would be; I am pleasantly surprised! I probably shouldn't speak too soon though, I have only done two blocks. My new quilt block keeper! I am starting a Farmer's Wife quilt-a-long and I wanted something, other than a plastic bag, to keep my blocks protected. I got to thinking a couple of nights ago and I came up with this. This is the front of the quilt block keeper. This is the inside where the blocks will be kept. Basically the blocks lay nice and flat underneath the elastic. What I liked about this is that they won't get wrinkled! When I am ready to piece the quilt together I will know right where they are located and I will be ready to go! I designed this myself, and this is the first one I have made. After completing the first one, there are some things I would do differently the next time but hey, you live you learn! And this one will get the job done, so no worries from me! I put some leftover blocks from a previous project in here so you could get the idea. This week I have been working on my Modern Meadows quilt. I finished cutting all my fabric and finished my first block. The block measures about 20" x 20", so it is pretty large. There will be 5 different block designs but they will all be similar to what you see. With 12 blocks total, the quilt will measure approximately 60"x80", the perfect size for lounging on the couch! Hopefully it will turn out alright. There was so much cutting involved and trying to keep all the little pieces straight is quite a chore. As you can see I used tons of sticky notes. I'm hoping to have this done in the next week or two. I will keep you all updated! My first "for real, for real" clutch! I needed a break from my "modern meadows" quilt so I decided to practice a few pouches before I make my pouch for the pretty "little" pouch swap. Here is my first attempt! I was pleasantly surprised with the results. It's nothing fancy, all I wanted was to get the general idea of how to put it together. Next time I might try to do something to make it a little more creative. I love learning new things! Time to get back to the quilt, I'll post pics later of my progress. I finished the binding on my scruffily quilt today. I love how productive I have been! If only I could be this way in all areas of my life! Well, I was planning on making this a lounging around blanket for my house but I think I have decided it will be going to my sister-in-law. I had planned to do a quilt for her using the modern meadows fabric but I just realized that she picked out all of the fabric for the scruffily quilt. So it only seems natural to send this one off to her and her new husband! All it needs is a label and it will be on it's way. How do you label your quilts? Do you use a printer? Do you hand write them? You get the idea .... share with me your intelligent ways of labeling your quilt. I have not found one that I am particularly in love with!